It is 10 years since Grangetown’s Polish shop opened – but a year ago it expanded and more recently opened a cafe upstairs. Owner Marcin Gozdziewski tells us all about it. How long has the shop been open now? The shop opened for the first time on 19th October 2006 in Penarth Road. It’s a family business and it was me and my wife working there at first. After it started to grow bigger we employed more people to help us. What’s you vision for place? Since opening I thought about quality and convenience and this is my motto. I wish my clients to have best products and service we could possibly provide. The premises on Penarth Road suddenly became too small so we started to look for a bigger place. Following my motto I always thought I’d like to deliver comfortable shopping so you can shop and then relax after. That’s why we have relocated to Clare Road when the former Enterprise Centre became available. And that’s why after opening Delicatessen we followed up with the Coffee Shop upstairs. What is so special about Polish bread? Well I personally think Polish bread is exceptional and you can find it in all sort of different flavours. It’s nice and moist inside and has a good crust on the outside. The bakers in Poland always try to be very creative and come up with decent variety of baked goods on the market, including sourdough bread, white bread, crescent rolls, baguettes, challah bread, bread loaves and rolls, light and dark, wheat, rye. There are also regional products like bagels and also bread for special occasions like harvest festivals and weddings. The baking industry has its very long tradition, where recipes have been improved from generation to generation. Some bakeries use recipes that can be up to 300 years old and the tastiest are based on sourdough starters. Poland is also one of few countries that still use rye flour to make bread, which has grander nourishing value than wheatflour. What’s your best seller? Dumplings or simply Pierogi (in Polish), we have different flavours and all are really popular also cured meats and cakes are selling very well. Our cakes are really nice and if you simply would like to try small piece before you buy whole big cake all for yourself and take it home, you can always pop upstairs and have it with a coffee. What would you recommend? I have my own favourites but I think it’s all up to personal taste, I think all cakes are well worth trying and as I said you don’t have to go away with a whole cake simply try a piece first or maybe a doughnut? They are slightly different to well-known British doughnuts but really tasty and big. Tell us about the new coffee shop Upstairs? It’s is a newly opened community coffee shop and was the first one in Grangetown. The idea was to create a friendly atmosphere where you can have a cup of coffee or tea followed by cake or maybe a sandwich and relax for a while. There is Wi-Fi access and we are happy to host any kind of event or meeting, simply let us know what you are up to. All customers are welcome; you don’t have to shop downstairs to get a coffee. Also we are thinking of holding social events in the future. 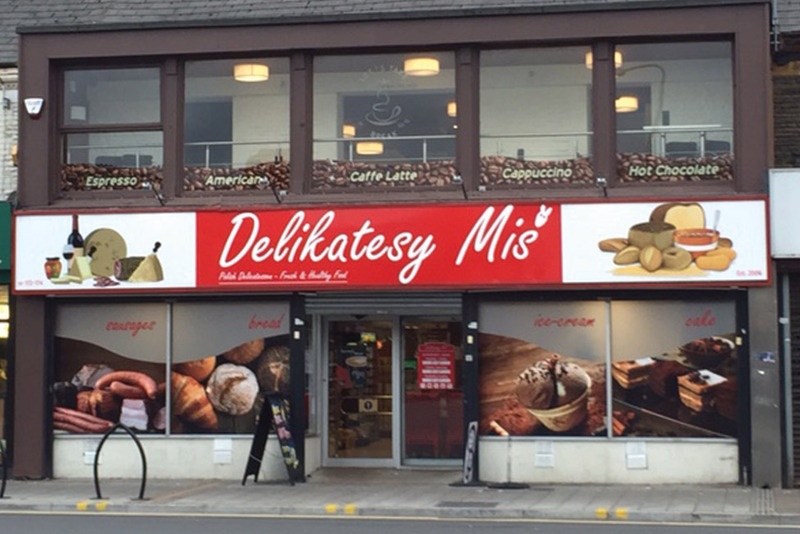 Polish Delicatessen MIS and Coffee Shop Upstairs, 172-174 Clare Road, Grangetown, Cardiff CF11 6JR Tel: 02920 251004, 02920 345720. Opening hours: Mon-Sat 8am-10pm; Sun 9am-9pm.